Is America Bored With Election 2016 Already? Television watchers the last few weeks might be forgiven for thinking that perhaps America was bored with Election 2016 already, as number of mentions of candidates from either party dropped to their lowest levels in almost four months. What's driving this drop in coverage and could it be that Trump's dominance over the airwaves is coming to an end? The timeline below shows the total number of mentions per day of each of the major candidates of both parties on national television networks Aljazeera America, Bloomberg, CNBC, CNN, Comedy Central, FOX Business, FOX News, LinkTV, and MSNBC from January 1, 2015 to October 10, 2015 using data from the Internet Archive's Television News Archive. Prior to Donald Trump entering the race, only two candidates had ever exceeded 1,000 mentions in a single day: Jeb Bush for a single day and Hillary Clinton for four total days. 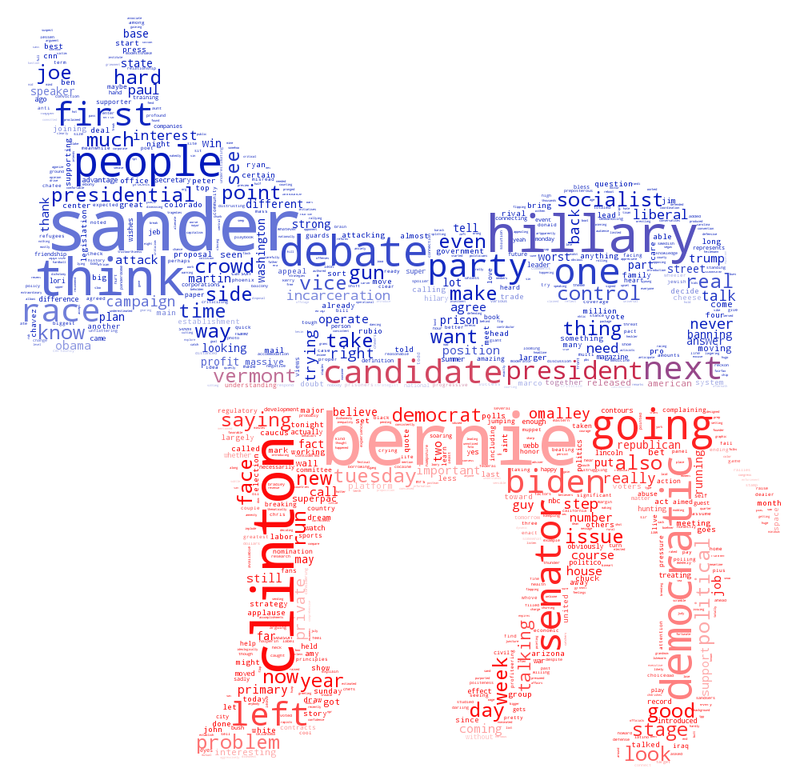 In fact, on a typical day, it was rare for any candidate to receive more than 500 total mentions, with the 2016 race staying largely under the media radar. Trump's arrival on June 16, seen in the timeline in light blue, transformed the race into a media frenzy, with Trump spending much of the last four months at more than 1,000 mentions per day. On September 16th, in the lead up to the second Republican debate, he set the all-time record for this campaign season, receiving 3,170 mentions in a single day. Yet, a close look at the right-hand side of this timeline reveals something striking: over the last three weeks no candidate has managed to rise much over 1,000 mentions per day, making this the longest stretch Trump has gone without a large media spike since entering the race four months ago. Even more shockingly, for the last 9 days Trump's lead has narrowed to less than 200 mentions over the next-closest candidate. For the last five days Hillary Clinton and now Ben Carson have either had more mentions than Trump or been within 75 mentions of him - the longest streak since entering where he has not completely dominated television coverage of the race. In fact, as the New York Times noted last week using this data, Trump's near-absolute media coverage lead over the Republican field has faded since the start of September. Let's look back at how we got here. For the first half of 2015, Jeb Bush accounted for almost half of all mentions of Republican candidates, making him the standout candidate. However, when Donald Trump entered the race on June 16, within two weeks he had rocketed to 60 percent of all television mentions of Republican candidates where he has remained between 55 and 75 percent ever since (briefly reaching 80 percent on July 20). Something happened the first week of September, however, and he now hovers between 40 and 60 percent of Republican mentions, falling the last two weeks to just 40-50 percent of mentions. 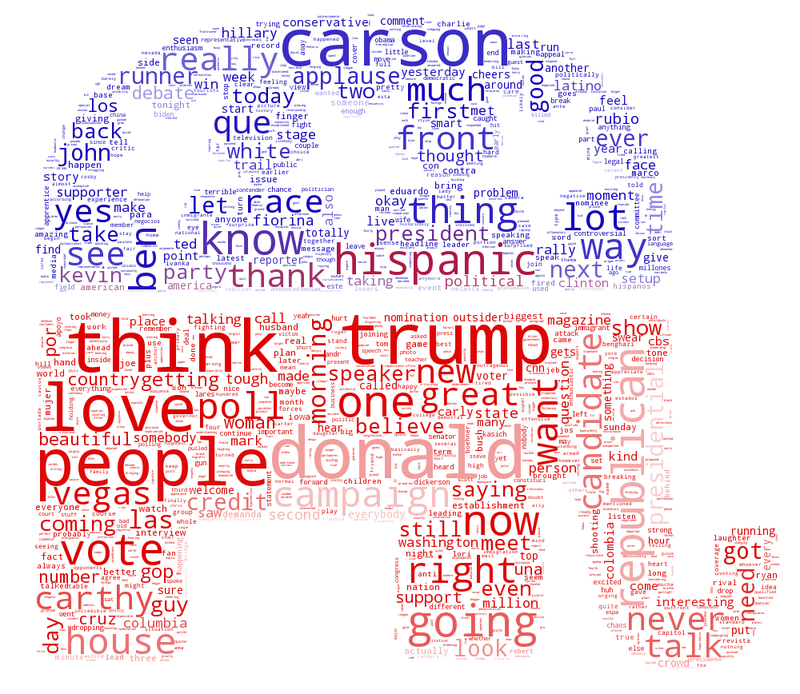 On five separate occasions over the last month another candidate has come within 10 percent of his lead and in fact the last two days Ben Carson has been almost equal in the percent of Republican mentions he has accrued. It is not just overall mentions where Trump is slipping. Using audio fingerprinting technology, I collaborated with the Internet Archive to track how "viral" the responses of each candidate in the two Republican debates went on television. We chopped up the full transcript of each debate, assigned each sound bite to its respective speaker, and then scanned all major television networks monitored by the Internet Archive for any rebroadcasting of that sound bite. In the first Republican debate, Trump was the undisputed leader, with his remarks accounting for 31.8 percent of all excerpts from the debate, compared with runner-ups Paul and Christie, who both received just over 14 percent of all excerpts. 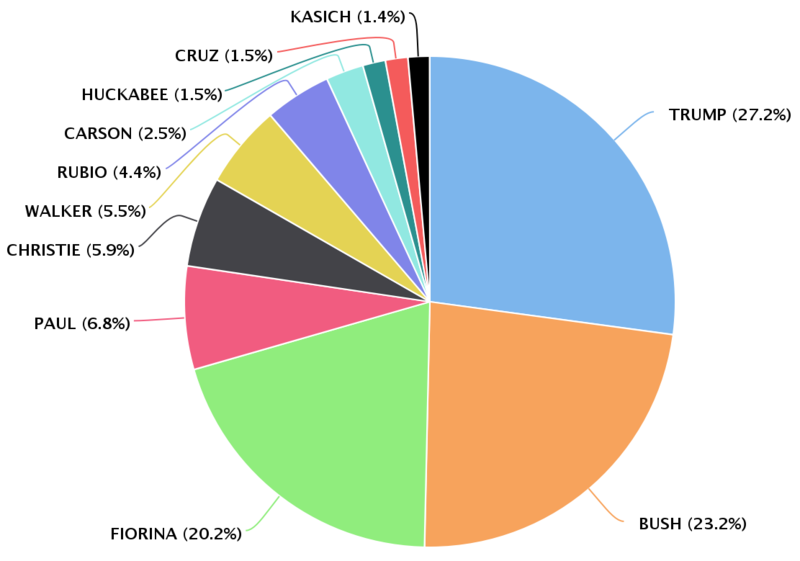 In contrast, the second debate was in many ways a three-way tie between Trump, Bush, and Carly Fiorina. Trump's statements still accounted for the most excerpts from the debate, but by a far lower margin. Why would Trump's falling media fortunes have such a profound impact on coverage of the 2016 presidential race? 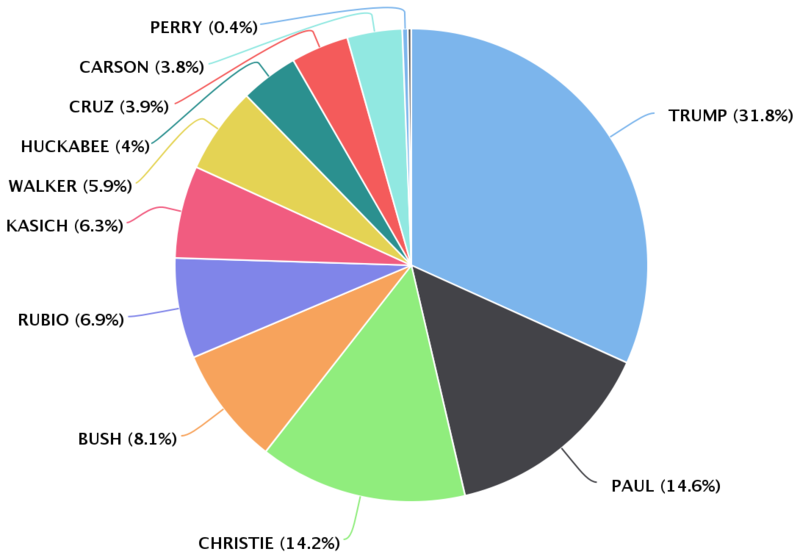 As the graphs above show, since entering the race, Trump has accounted for almost half of all mentions of candidates from either party, essentially positioning his campaign as the face of the 2016 race itself. Despite 2015 opening with clear likely winners for both the Democrats (Hillary Clinton) and Republicans (Jeb Bush), television coverage focused on the Republican race, with GOP candidates receiving around 80 percent of all television mentions through the end of February, as seen in the timeline below. Yet, suddenly on March 3rd, with revelations of Hillary Clinton's use of a private email server when she was Secretary of State, Democratic candidates began receiving equal air time with their Republican colleagues until mid-June when Donald Trump entered the race and reestablished Republicans as accounting for 70-80 percent of mentions. Beginning earlier this month with new revelations of Clinton's email use, Democrats once again briefly reached 50 percent of mentions, demonstrating that not all news coverage is good coverage. 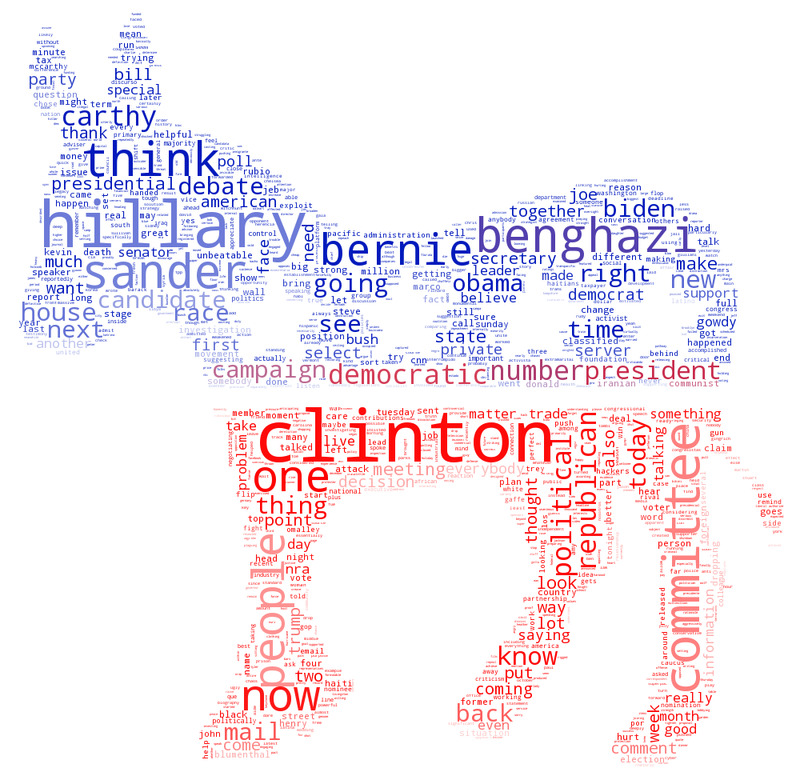 Looking at the most common words appearing within 10 seconds of all mentions of each candidate on national television this past Friday, October 9, the word cloud below shows that the Benghazi Committee, Bernie Sanders and her private email server dominate coverage of Clinton. Sanders' coverage is dominated by gun control, race, prison reform, and the debate, with Hillary Clinton also being heavily mentioned. 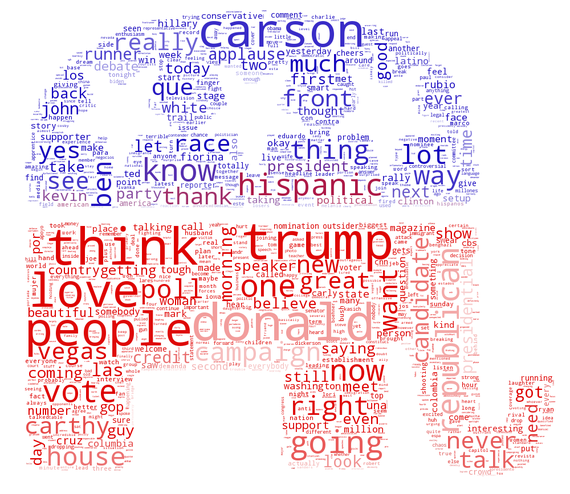 On the other hand, Donald Trump's coverage emphasizes relatively positive language like "love" and "think" and "yes," but also his remarks regarding Hispanics and the rising prominence of Ben Carson that is threatening his lead. What does all of this mean? In summary, Donald Trump's television dominance appears to be fading rapidly over the last month and a half, which has reduced overall coverage of the election, since he accounted for almost half of total television campaign coverage. Reporting on Hillary's private email server has given her a substantial boost in television coverage, but at the cost of very negative coverage fixating on accusations of past wrongdoing, rather than on her present candidacy, proving that not all coverage is good coverage on the political trail. 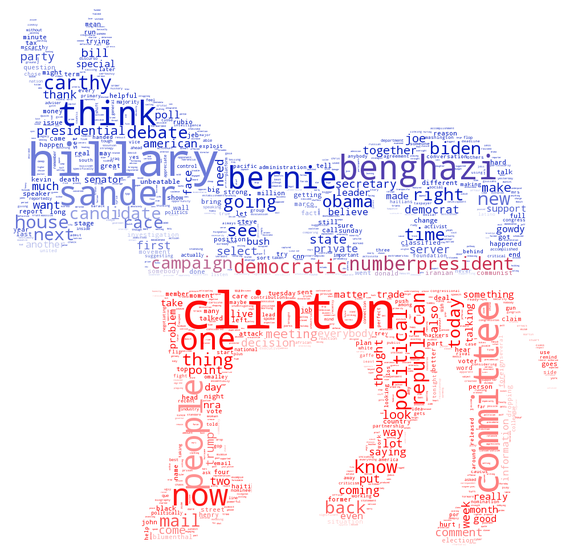 You can follow along with the latest numbers each morning with my 2016 Campaign Television Tracker interactive dashboard, word clouds, and Atlantic's mobile-optimized tracker, giving you plenty of options. I'd like to thank the Internet Archive's Television News Archive for the data used in these analyses.